DO-35625-15 was succesfully added to your cart. Taking temperature measurements has never been easier-just point the thermometer at your target and push one button! The Digi-Sense infrared Stick thermometer is ideal for use in the food market, but can also be used in the home, office, field, or lab-anywhere you need to quickly and accurately measure surface temperatures. 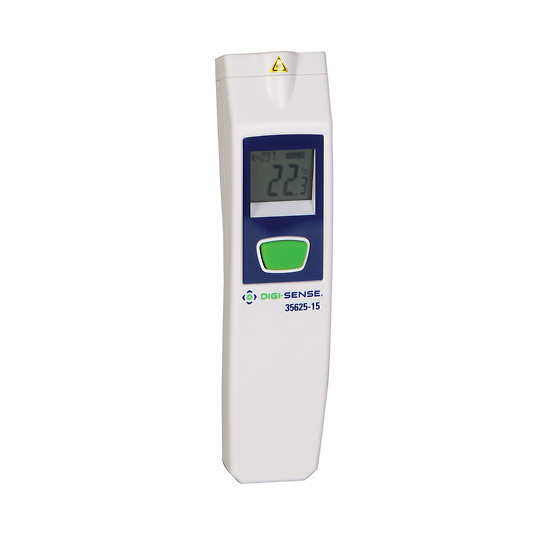 The Digi-Sense infrared Stick thermometer features a IP-54 water- and dust-resistant rating distance-to-sight ratio of 4:1, temperature range of 0 to 575°F (–18 to 302°C) and ±2% basic accuracy. Other features include automatic data Hold, °F/°C selectable units, fixed emissivity, backlit display, and auto power-off. Accuracy of ±2degF (±1degC) over the HACCP critical temperature range of 40 to 140degF (4 to 60 degC). Can it be used to measure mechanical-automotive parts temperature? This is suitable for taking parts temperatures.